Madoka Kaname, an ordinary middle-schooler, along with her best friend Sayaka Miki, are offered the chance to have any wish they want granted by the mysterious Kyubey, and become magical girls and fight witches. However, fellow magical girl Homura Akemi seems intent on stopping Madoka from becoming a magical girl at any cost. 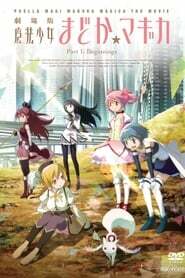 Puella Magi Madoka Magica the Movie Part I: Beginnings is a retelling of the first half of the TV anime series.